Inspired by Pointillism, the OCULUS Deck features a full-bleed borderless design with bold and vibrant Reds and Blues. The design is meant to flow through flourishes and allow for continuous displays that aren't possible with borders, and to provide dynamic table displays. The OCULUS Deck is produced by Mike Wilson (theDoc318) and designed by Randy Butterfield (Midnight Cards). The Court Cards each have a radial design structure that gives them an abstract, yet familiar, look to them. The PIPS and Indices have a non-typical Red (Hearts / Diamonds) and Blue (Clubs / Spades) color combo, and are easy to read for maximum playability. Making this a Deck that can become part of your every day carry, as you can practice Cardistry and Magic. 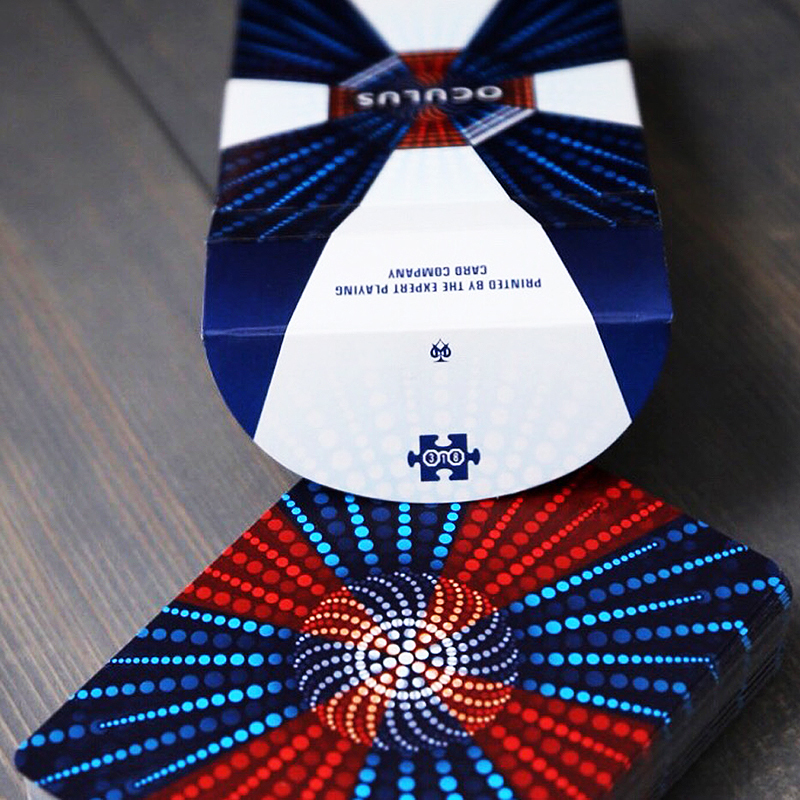 The OCULUS Tuck Box features a bold design of Red and Blue, with striking accents of White. The printing features include 4-Color Process, Embossing, and a clear UV Spot Ink to accent specific design elements. Printed by Expert Playing Cards, with their Taiwan printer, the OCULUS Deck utilizes their exceptional Classic Finish and is Traditionally Cut. • The cards are poker size.